 Last month The New School in New York City hosted a conference that billed itself as a “coming-out party for the cooperative Internet,” called platform cooperativism. The conference’s central themes emerge from critical reflection on the rise of the so-called sharing economy and its implications for the economy (e.g., the wellbeing of workers) as well as the Internet (e.g., how Net-enabled services are designed and owned). At first this conceit may not seem germane to Farm Hack and its concerns with innovation and exchange in agriculture, perhaps because the services many “sharing economy” companies provide—micro-tasks; car rides; etc.—don’t seem relevant. Although the ethical and regulatory questions such companies elicit may not be relevant to agriculture, apposite research about alternatives to the new status quo—peer-based production and cooperation—is. J. Nathan Matias and Katie Arthur of the MIT Center for Civic Media liveblogged much of the conference, including discussion about research into these topics. What follows are some interesting extracts from their posts. Arthur covered a session on “Conditions of Possibility,” in which activist and academic Mayo Fuster Morell cited new data  on the evolution of commons-based peer production and its extension from “classic cases including Wikipedia and FLOSS (Free/Libre and Open Sourced [sic] Software” into areas such as citizen media, gaming, and sensor networks. platform cooperativism doesn’t necessarily address the issue that our economy is entering—or in—a new era of transition in which we’re not only automating work, but assigning more of it to machines. IMO—not Benkler’s—this underscores the importance of leveraging the commons to facilitate the spread and exchange of knowledge—Farm Hack’s raison d’être—so that technology remains a source of empowerment. How will a commitment to the commons inflect the design of organizational formats for agriculture that are both collaborative and commercial in nature? Thoughts welcome. From the P2P Value Directory: http://directory.p2pvalue.eu/. A simple and brilliant idea for the DIY, anti-disposable, community-based hacker movement! 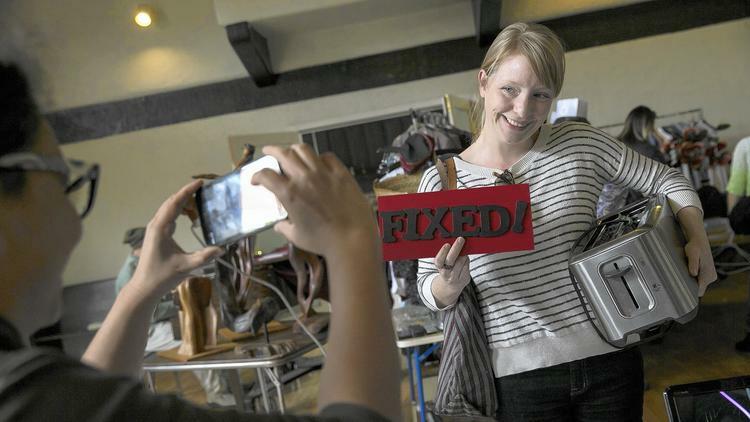 Repair Cafés are free meeting places and they’re all about repairing things (together). 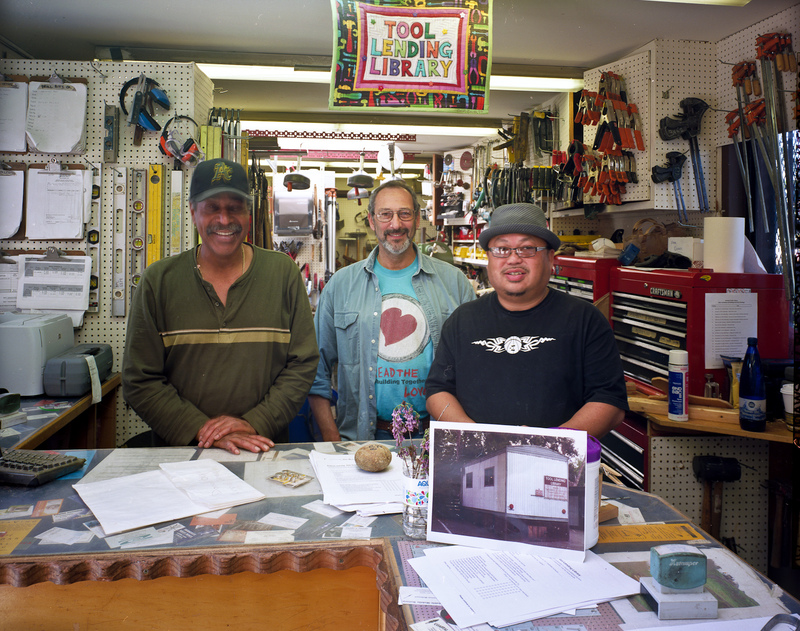 In the place where a Repair Café is located, you’ll find tools and materials to help you make any repairs you need. On clothes, furniture, electrical appliances, bicycles, crockery, appliances, toys, et cetera. You will also find repair specialists such as electricians, seamstresses, carpenters and bicycle mechanics. Ben Flanner, president and farmer at the NYC rooftop farm Brooklyn Grange (and co-host of Farm Hack NYC last fall), talks on this week’s Farm Report episode about different organizations and projects that are helping farmers create and innovate on their farms and share these designs and tools, and strategies the Grange has adopted to grow productively in a limited rooftop space. And read up on the Farm Hack NYC meetup and build project he mentions in the forum! You likely have heard of Kiva.org, a micro-lending site that lends to the entrepreneurial projects of individuals in developing countries through crowdsourced financing. A year-old project of Kiva is Kiva Zip, which flips the tables. Through Kiva Zip, individuals in the United States (and Kenya) can apply for an interest-free loan up to $5,000 for their project. This tool could be great for farmer-entrepreneurs with a well-developed innovation idea that want to market their innovation to others, and that need startup capital to bring this project online. One Farm Hacker has already used Kiva Zip to do this – Louis Thiery, co-developer of the FIDO greenhouse monitor, applied for and received a $5000 loan through the service to produce 100 initial units of the Fido monitor. This loan allowed him to build the original FIDO unit, and also develop a second improved iteration, now called the Sentinel Bee, through his new business Apitronics. To receive a Kiva zip loan, you must apply through a Kiva Zip Trustee, whom you can locate on the site. You also need to prove your business plan is viable, and be vouched for. If you are applying for a loan, let us know at info [at] farm hack [dot] net, and we can vouch for your project! Once you are approved, your project is then posted to the site, where users (hopefully) crowd fund your project. The great thing about the Farm Hack community is that we can use our network to get out the word about projects, and ensure they get fully funded. Use that farm hack community capital! Find more info about Kiva Zip on their website. 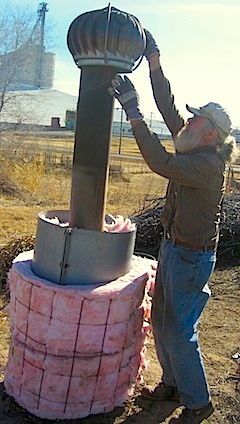 David Yarrow and the folks at Four Oaks Community Farm in Topeka, Kansas, are making some exciting strides towards an efficient small-scale TLUD (Top-Lit Updraft) biochar stove. They’ve done 6 experimental test-burns thus far, and are learning more with each one. Biochar is produced through a controlled process of heating up biomass in a lo/no oxygen system. In the absence of combustion, the result of the burn process is mostly biochar, and sometimes syngas. The process, when done correctly, produces no carbon dioxide, and is in fact a way to sequester carbon from the environment into a stable form that can be stored in the soil. This stored biochar can be used to make a “microbial reef” in our soil. Biochar holds much promise for the mitigation of climate change, and also provides a useful soil amendment for crops that need high potash and pH. At 4 Oaks Community Farm, David and his colleagues are ready to find equipment and insulation to build a better, more efficient, permanent TLUD. They will be holding four biochar workshops in April, and are also preparing to build a smaller, 30-gallon TLUD that is portable. They’ll take this smaller stove to events and fairs around the region to spread the word about biochar and teach people how to make it. They are innovators and changemakers worth checking out! Here is a great video made by Jeremy Smith of a water pump built by Cappie of Pangea Farm in Spearfish, SD. 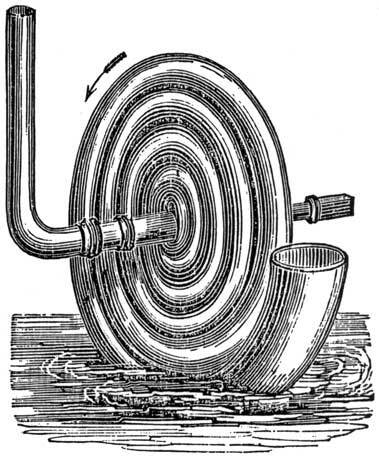 The pump, which is a “Wirtz pump”, uses a coil of hose and a scoop which are turned by a waterwheel in an irrigation ditch, pumping water 30′ or more vertically into a holding tank, from where it can then gravity-feed into livestock tanks, drip irrigation, etc. This version pumps about 1 gallon per minute, depending on the flow of water through the irrigation ditch. Passive Water Pump from Jeremy Smith on Vimeo. They also ran experiments that confirm that these pumps work quite well regardless of how quickly the water source (stream/irrigation ditch) is moving. The amount of water pumped increases pretty linearly with the water speed, but even at very slow speed the pump still operates at about the same overall efficiency. – Pillow block bearings to hold the axle (worth the extra cost for their durability and ability to absorb lateral force if axle is out of square with mounts). – Waterproof swivel joint, joining rotating axle to the stationary pipe carrying water to holding tank. 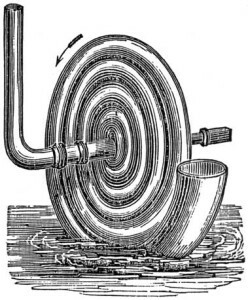 – Overflow line to return water to ditch when tank is full. Lots of possibility for modification for other uses! Tool lending libraries have been established in quite a few communities– Berkeley’s, which is part of the city’s public library system, is probably the most famous. But these tool libraries are aimed at homeowners. It isn’t unusual for farmers to share infrastructure (like large cooperatives that share processing equipment), and neighbor farmers may informally share equipment (my own farm shares a potato digger with two other vegetable farms, since we each only need it a day or two per season), but organized sharing of tools and equipment between farms isn’t very common. Ten small farmers in North Carolina have cooperated to take things to the next level, after getting grant funding to establish a Sustainable Agriculture Tool Lending Library. They put up money to purchase implements and tools that no single farm needed on a daily or weekly basis, like a disc harrow, a manure spreader, and a trailer to move the tools around on. To coordinate who gets to use what tool when, the group is using tried-and-true methods of communication like monthly meetings, and newer ways, like Google Calendar. Although they note that sometimes it may be hectic if multiple farms want to use the same tool on the same day– common when weather is dictating what you can do when– they are mindful that without the Library, they probably wouldn’t have access to most of these tools at all. The Library is targeted at new-entry farmers who are making their living farming, since these are usually the growers with the least resources to purchase the appropriate equipment. Sustainable Agriculture Tool Lending Library from RAFI-USA TCRF on Vimeo.